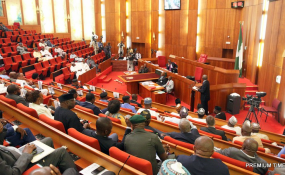 Amidst rowdiness, the Senate on Wednesday passed resolutions to check the roles of the military in the 2019 elections and "inconsistent application of electoral laws" by the Independent National Electoral Commission (INEC). "The Senate is conscious of the need to grow our nascent democracy through the institutionalisation of procedures, application of civil laws and the restriction of excessive use of military force in the civil affairs of the state," said Mr Melaye. "The Senate is persuaded that the nation is on the edge of a precipice, and our democracy can be saved for future posterity if only we can build strong institutions that can operate within established laws, and with our military forces restricted to their traditional roles of defending the nation." "In the midst of all these, it is pathetic that there is no presidential broadcast or statement from the leader of this country. This is a national calamity," he said. "Whoever is siding with what went wrong in the elections is unfair to Nigerians. That election is a sham. There was no way that election could have been an advancement of the 2015 election. "Everything was inconsistent; INEC was inconsistent. The parameters they used were different in states and units. That is wrong," she said. Adopting the four prayers of the motion, the Senate condemned the 'massive use of military forces in the national electoral process of the nation' and urged INEC to ensure the unrestricted and consistent application of all electoral laws without bias to a candidate or a party in all elections.